When you get a blood cholesterol test, the results reveal information about three types of lipids in your arteries: low-density lipoprotein cholesterol, also known as LDL or "bad" cholesterol; high-density lipoprotein cholesterol, sometimes called "good" or HDL cholesterol, and triglycerides, a type of fat that tends to clog your arteries. 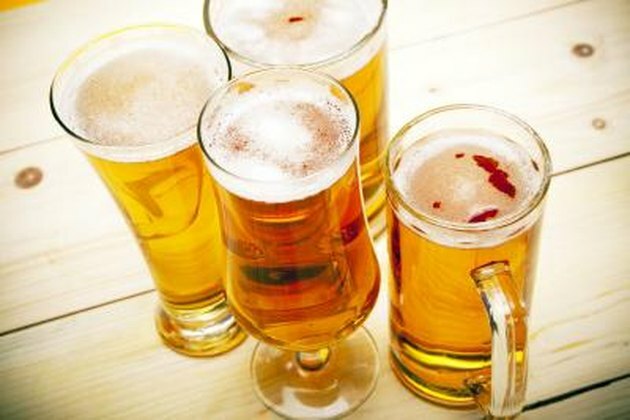 Drinking beer may elevate your triglycerides. If your beer consumption leads to weight gain, it may also harm your LDL and HDL cholesterol levels. Healthy LDL cholesterol measures below 130 mg/dL, or milligrams per deciliter of blood. If you face additional risk factors for heart disease, such as high blood pressure, diabetes or obesity, your doctor may suggest you aim to keep your LDL cholesterol much lower, possibly below 70 mg/dl. Healthy triglycerides measure 150 mg/dl or less and the American Heart Association in April 2011 issued a statement recommending that you keep your triglyceride levels below 100 mg/dl. HDL levels higher than 60 mg/dl help protect you against heart disease – your HDL cholesterol helps pull LDL cholesterol and triglycerides out of your system. Foods in your diet, including saturated fat, trans fat, sugar and alcohol, may elevate your triglycerides. If you drink beer, limit your consumption. If you're a man younger than 50, include no more than two 12-oz. beers in your daily menu. Older men and all women should drink no more than one 12-oz beer a day. Other types of alcohol also may elevate your triglycerides. If you drink wine, limit your intake to one or two 4-oz. glasses. If you drink 80-proof liquor, imbibe no more than one or two 1 1/2-oz. servings per day. If you drink 100 proof liquor, 1 oz. equals a serving. Drinking beer may lead to weight gain. If you drank two 12-oz servings of beer a day, you'd add about 300 calories to your daily total. If you didn't compensate for these extra calories – eliminating 300 calories from food in your diet or exercising enough to burn off the additional calories – you could gain 1 lb. every 11 or 12 days, based on the calculation that 3,500 calories equals 1 lb. of fat. Being overweight may elevate your LDL cholesterol and triglycerides as well as reduce your heart-protective HDL cholesterol. If you eliminated just one beer from your daily diet, you could lose 15 lbs. a year. Losing just 5 lbs. to 10 lbs. can improve your cholesterol levels. Moderating your beer consumption can help keep your cholesterol at heart healthy levels. If you don't want to raise your cholesterol, it also helps to follow a low fat, low sugar diet. Limit saturated fat intake to 16 g to 22 g a day, trans fat intake to 2 g a day and calories from added sugar to about 100 to 200 calories a day, based on a 2,000-calorie-a-day diet. Animal products such as red meat, cheese and butter contain high amounts of saturated fat. Margarine and shortening contain trans fat, sometimes used by restaurants for deep frying. A single can of regular soda contains more than 100 calories from sugar. Does Sugar Intake Raise Cholesterol Levels? Does Drinking Diet or Regular Soda Affect Cholesterol Levels? Does Ice Cream Cause High Cholesterol? How Does Splenda Affect Triglycerides?